Convert your PSD to Drupal Theme from $149, Best Quality or 100% Moneyback. Catering to the Web content management solutions of industries that require websites of simple or fairly complex nature, Drupal is one of the vastly sought after Content Management System (CMS) solution by Developers worldwide. Almost all major social and industrial strata rely on Drupal to weave websites solely because of the amazingly detailed user experience it offers in comparison to the other platforms offered, ultimately favouring a higher conversion rate. At HTMLSliceMate, with a code squadron of diligent, dedicated and dynamic front-end developers, we’ve seen through thousands of projects involving PSD to Drupal conversion related solutions and hundreds of clients with pride. We as your fast and reliable development partner know the complexities of the framework inside-out, ensuring an optimal build by means of a thorough analysis and determination of site configuration, apt theming and proper use of plugins, along with custom module development- following repeated short iterations all along the development process to ensure an absolutely flawless result- especially when it comes to custom development solutions. Be sure in choosing us for your PSD to Drupal conversion as we offer strict NDA and 100% Money Back Guarantee if you are not satisfied with the work we deliver. With tools that support advanced menu, polls and user management and sophisticated graphics support, Drupal provides stellar functionality when it comes to building simple websites as well as advanced websites. Drupal facilitates the easy storage, re-use, search and management of web pages by means of user defined listings, paths and URLs. The Drupal script offers flexibility in customising design elements. The themes and templates offered along with the predefined page function combinations offer better graphical customisation. 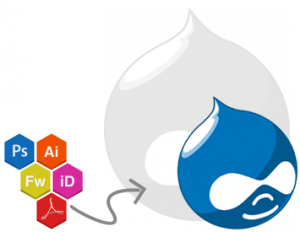 With Drupal, the management of your website follows a more streamlined approach. An administrator is capable of creating user controls and subsequently defining their permissions, along with assigning a set of tasks to an individual or a group of individuals managing sections of the website. Can I have my HTML site converted to Drupal? Sure you can! Just have all your build requirements specified on your email to us on mail@htmlslicemate.com, and we’ll be sure to give you our best. Alternately, you can also reach us via the live chat and our support team will walk you through the whole process. Easy! Can I customize an existing Drupal powered website? Yes you can- HTMLSliceMate can make just about any customisation on your existing Drupal site as you’d like, just get in touch with our team on mail@htmlslicemate.com, or drop us a ping on the live chat and we’ll gladly assist you with it. For any Design to HTML / HTML5 / Email services, we take the full amount upfront and for CMS (WordPress, and Magento) projects, we take 50% of the total payment at the start of the project and the rest at the end of the project.